Iraqi protesters stormed and set fire to a provincial government building in the southern city of Basra, despite a curfew imposed by authorities Thursday to try and quell demonstrations against poor public services and unemployment that have turned violent. Three protesters were shot dead by security forces, according to a medical and a security official. They spoke on condition of anonymity because they were not authorized to release information. Southern Iraq, heartland of the country's Shiite majority, has erupted in unrest in recent weeks as protesters express rage over collapsing infrastructure, power cuts and corruption. Twelve civilians have been killed since the start of the month during confrontations between demonstrators and police, according to Iraq's Independent High Commission for Human Rights, which said another 93 civilians and 18 security forces were wounded. The committee has accused security forces of using "excessive force" against unarmed protesters. At least 18 security personnel have been injured over the same period, according to the rights committee. Government officials, meanwhile, have accused "saboteurs" of inciting violence, while demonstrators accuse security forces of resorting to deadly force to disperse peaceful protests. On Wednesday, Army Commander Jamil al-Shammari blamed "unidentified gunmen" for the recent protester deaths in Basra. Shortly afterwards, Iraq's Sairoon coalition -- led by firebrand Shiite cleric Muqtada al-Sadr -- called for the dismissal of leading army officers in Basra, who it blamed for the recent deaths. "The government -- both federal and local -- is tasked with safeguarding lives and preventing the use of undue force," leading Sairoon member Hassan al-Akouli said at a news conference in Baghdad. Port employees said that all operations had ceased on Thursday morning at Umm Qasr port - the main lifeline for grain and other commodity imports that feed the country - after protestors blocked the entrance. Trucks and staff were unable to get in or out of the complex. Officials announced a citywide curfew would be in place after 3 p.m. local time, but cancelled it just as it was due to come into force. A senior security source told Reuters that a heavy deployment of security forces - including members of the rapid response team - would be on patrol in Basra to enforce the curfew and impose calm. The protesters began blocking the entrance to Umm Qasr port, which lies about 60 km (40 miles) from Basra, on Wednesday. 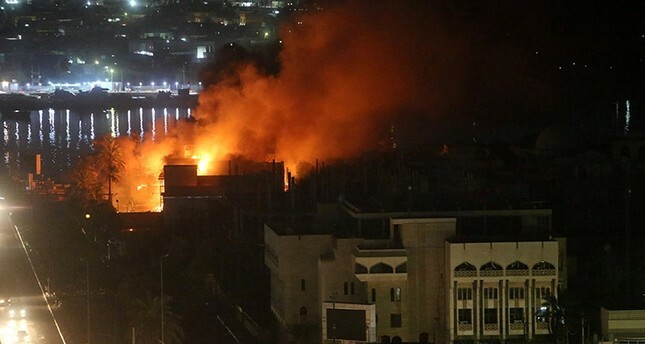 They also blocked the highway from Basra to Baghdad and set fire to the main provincial government building where they had been demonstrating for a third night. Public anger has grown at a time when politicians are struggling to form a new government after an inconclusive parliamentary election in May. Residents of the south complain of decades of neglect in the region that produces the bulk of Iraq's oil wealth. Incumbent Prime Minister Haider al-Abadi convened an emergency cabinet meeting on Tuesday to discuss the unrest and ordered the Interior Ministry to conduct an immediate investigation into the protest. At a news conference on Thursday, Moqtada al-Sadr, a populist Shiite cleric whose electoral bloc came first in May's national election, called for an emergency televised session of parliament to discuss the crisis in Basra, a city "without water, electricity or dignity." Iraq's second biggest city, Basra is a stronghold of Sadr who has recast himself as an anti-corruption campaigner and has allied himself with Abadi. On Wednesday security forces sprayed tear gas and fired into the air to try to disperse demonstrators. According to health sources, the dead protester was struck on the head by a smoke grenade during the clashes. Wednesday night's death brought the total number of protesters killed during clashes since Monday to seven, with dozens more injured. Tens of security forces members had also been injured in the violence, some by a hand grenade, local health and security officials said. Residents of Basra and other cities in Iraq's southern Shiite heartland have been protesting since July over endemic corruption, soaring joblessness and poor public services. Meanwhile, negotiations remain underway over the formation of the country's next government following controversial May 12 general polls, results of which were disputed for several months.